As a business owner or marketing leader, you need to be on the top of your game and you need to be aware of every new trend that’s out there in the market. To do that, you need to follow the people who are best in the industry and the blogs that cover the latest trends, analysis, and that give you the best tips when you want. Video content is a valuable category that’s picking up speed, and marketers have started to realize its importance. 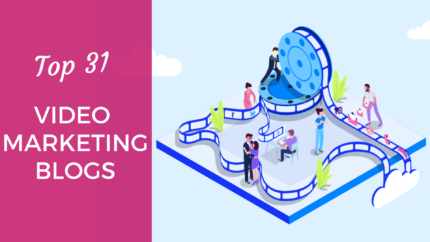 So if you want to stay on top of the game when it comes to video marketing, you’ll love this list of 31 video marketing blogs that I have created for you. Wistia is a video hosting company (just like YouTube) that provides products that you can use on your website & in your marketing campaigns. Wistia’s blog is the best out there if you want to learn about video marketing and video creation. They write a lot of content about producing videos, marketing videos, video production and everything that’s related to video marketing & creation. Additionally, they have also produced a number of technical know-how videos. So if you want to get started in the world of video marketing, Wistia is a good place to start. Click here to access their blog. Flipboard posts a lot of updates, tips, and tricks on video marketing. This content is not self-published. It is a curated selection of content that was chosen form the content that several authors submit on Flipboard. It catalogs the best stories on a particular topic. So, if you want to read the finest selection of content on video marketing, go to Flipboard and start reading stories over there. You’ll be able to access about 5-6 posts on video marketing per week on Flipboard. GoAnimate is an animation video company based in of San Francisco and Hong Kong. They provide a platform where you can create animation videos on your own and share it out with the world. Their blog is one of the best when it comes to animation related videos. They have covered everything from animated characters, EBooks, webinars, animated videos and so much more. Their blog is the best source for animated videos and marketing material related to it. Golden arm media is a business blog that writes about video marketing and DIY tips that help you create high-quality videos. Their team of writers has created great content for categories like video marketing, video production, and animation. They operate in Austin (Texas) and provide animation video services to small businesses and startups. The Wizmotions team has expertise in the field of custom whiteboard animation videos. They can expertly convert your business ideas into high converting and thought-provoking videos. They have a lot of content focused on custom whiteboard animations. If you are someone who is trying to market and learn more about whiteboard animations, you should check out their blog. Instead of focusing solely on video marketing alone, they cover a lot of digital marketing advice on their blog. You can head to their blog and check the latest advice on digital marketing, how to market and create your videos, etc. Because they have a team of experts, they cover a lot of actionable up-to-date advice on their blog. So you know that whatever they are writing, that’s an actionable piece of advice and thus can be put to use right away. Wideo is essentially a tool which anyone can use to create high-quality videos and presentations for their audience. They usually pump out 4 posts a month, and their content is great for what they do. Visually runs a category on their blog that produces a lot of content on video marketing and video production. They are a brand that largely focuses on creating infographics, videos, and eBooks for your marketing campaigns. They create content almost once every month, but whatever they create is great and adds a lot of value to their field. Shopify has a great content marketing team. They have been curating and creating content for marketing, sales, and growing businesses for quite some time now. They have a lot of content on using video marketing for maximizing sales as an e-commerce company. The team of Video marketing 2.0 has covered a lot of ground when it comes to video marketing with their content. They produce a lot of content based on audio and podcast. The level of detailing and in-depth research that very obviously goes into the production of their content is unparalleled. If you are someone who wants to learn the technicalities of video marketing, then you should bookmark their blog. Tubular insights team writes a lot of content focused on video marketing, video marketing trends, data insights, and more. They focus mainly on digital marketing & create a ton of content on video marketing and video creation. They post a blog article once a month on their website. Sprout video covers a lot of content on video hosting, video marketing, and the latest trends in the world of social media video sharing and production. It is an amazing video hosting platform that provides video and video related hosting to everyone. They work just like wistia. They also create a lot of niche content for video analytics and video insights. Their posting frequency is about 3 posts a month. Video brewery team is based in Chicago. If you are looking for a website that can give you updates and news related to video space, then video brewery is a good website to bookmark. They post a lot of tips, tricks, and video samples so you can get inspired and then yourself curate high-quality video content for your business as well. Ignite social media is a company based in the U.S. They create a lot of content related to social media and focus on how to get more reach for your brand. What they do a lot of marketing for high-end brands, community building, video marketing, and they are doing a lot of work in the podcasting space. Yum Yum is a company based out of Bueno Aires, Argentina. They create targeted business marketing videos which are aligned to your business goals and end results. Also, create video marketing content for almost all types of buyers and their journeys. They post about 3-4 blogs pieces every month. Wowmakers is a company that’s operating out of Kerala, India. They deal primarily with video production in the animation section. They have written a lot of guides on animation and animation related content. They are a company based out of Washington DC. They have created award-winning videos for some of the most well-known brands out there. Check out their blog if you want to learn more about the type of campaigns that they have run, and take inspiration from them. They post one blog every month. Story me has covered a lot of case studies, video testimonials, tutorials, and all other types of video marketing content that can help you get more results from videos. Check out their blog if you want to learn about what they do, and to stay updated in the field of digital marketing. Fat guy media is a video marketing company based out of Mineola, New York. Even though they are a web design company, they specialize in providing a lot of video and video marketing based advice. They post once a month on their blog. Supercool is a company based out of Los Angeles, California. They produce a lot of content in the fields of online media, video marketing, video production, and social media. They have a lot of experience and have worked with some of the most well-known brands out there. What they write about is coming from experience, and they have the results to prove it. They have a frequency of about 3 posts a month. Digit pro is a blog that is operated out of London. They create a lot of content and long extensive guides focused on marketing solutions. You should check out their blog and filter for video and video related marketing advice. Video guru is a marketing agency that specializes in delivering high-quality and effective marketing campaigns for companies that aspire to increase their revenue-line using the power of video marketing. They not only design and create your videos but they can also help you formulate and create a proper distribution channel for your brand. They post about 1 blog per month. Creativa videos is a Melbourne based company that operates in the video marketing space. It creates high-quality video content for all types of businesses. You can follow their blog to keep yourself updated on all the tips, tricks, and knowledge related to the world of digital marketing and video marketing. They have a frequency of about 1 post per month. Web videos marketing is a blog that keeps up with whatever is new in the video marketing space. They cover a lot of industry trends, content strategies, and video production from the web video marketing council. Vidyard is a video marketing company that has done a lot of video marketing campaigns for some of the most well-known fortune 500 companies. With all the work that they have done with these companies, they have a lot of success stories to share. And share they do. Not only that, their standalone content on Video marketing and video production is equally excellent. Click here to access the vidyard blog. Thinkwithgoogle gives you a lot of the usual video marketing related advice, but they cover a lot of data on the world of videos and data insights based on it. It sources a lot of content and data from YouTube and then prepares reports based on those data units. Hubspot is a product company which has long been covering everything under the sun that is related to sales and marketing. They don’t specifically focus on the content, like the other blogs mentioned on this list, but they have covered a lot of content which is related to video marketing. If you have time after going through the other blogs, then you must bookmark Hubspot as well. The Marketingprofs team focuses on B2B category more than the B2C one. You can find content on almost every topic related to video marketing and video content creation. Additionally, they also have a huge library of podcasts and webinars which are targeted towards video marketing. The vimeo blog has excellent content which is best suited for people who are business owners, marketers, and filmmakers. They have a video school series which is excellent for people who want to learn how to do video creation and production. They also have business tips section which is geared towards marketing, business, and video marketing based advice. Social video marketing blog is packed with actionable and tactical advice for people who want to create videos and market them on social media platforms. It has advice created specifically for marketers, small businesses and startups, which means all the advice that you see is ROI based, and hence, can be put to use right away. Unruly media is a global company that provides video marketing advice and service to brands all across the world. They have covered a lot of branded vines, Instagram, and other social media marketing video advice. They post 3-4 blogs every month. If you are someone who is starting from scratch, then pulling off a successful video marketing campaign can be a challenging task. I’d recommend that you follow these blogs if you want to keep yourself updated with all the new events and changes in the world of video marketing. If you are also planning to create a video, find the fair price through our video price calculator – here. Vidsaga is a global marketplace for Organizations to hire Video Creators. Currently, 1100+ businesses including Shell India, News 18, Carlton Luggage (VIP Bags), Hindustan Times, FeverFm, Mysmartprice are using our platform.